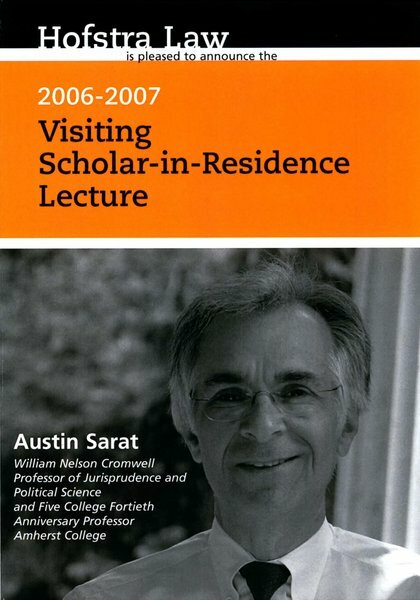 Austin Sarat is the William Nelson Cromwell Professor of Jurisprudence and Political Science and Five College Fortieth Anniversary Professor at Amherst College. He is president of the Consortium of Undergraduate Law and Justice Programs and former president of the Law and Society Association and the Association for the Study of Law, Culture and the Humanities. Professor Sarat is author or editor of more than 50 books, including Mercy on Trial: What It Means to Stop an Execution; When the State Kills: Capital Punishment in Law, Politics, and Culture; Something to Believe In: Politics, Professionalism, and Cause Lawyers (with Stuart Scheingold); Cultural Analysis, Cultural Studies and the Law: Moving Beyond Legal Realism (with Jonathan Simon); Looking Back at Law's Century (with Robert Kagan and Bryant Garth); Law, Violence, and the Possibility o f Justice; Pain, Death, and the Law, and Blackwell Companion to Law and Society. He is currently writing a book titled Hollywood's Law: What Movies Do for Democracy. Professor Sarat is editor of the journals Law, Culture and the Humanities and Studies in Law, Politics, and Society. His work has appeared in The Los Angeles Times, The American Prospect, The New York Times and on "The Today Show." He has been a guest on National Public Radio, "The News Hour," "Odyssey," and "The O'Reilly Factor." Austin Sarat is the co-recipient of the 1997 Harry Kalven Award given by the Law Society Association for distinguished research on law and society and co-recipient of the 2004 Reginald Heber Smith Award given biennially to honor the best scholarship on "the subject of equal access to justice." Given in recognition of his work on cause lawyering and the three books he has produced on the subject. Professor Sarat is the first person from a liberal arts college to whom this award has been given. In 2006 he received the James Boyd White Prize from the Association for the Study of Law, Culture, and the Humanities for distinguished scholarly achievement and in recognition of outstanding and innovative contributions to the humanistic study of law. Sarat, Austin D., "Sovereignty, Mercy, and the Limits of Law: The Case of Clemency in the Killing State" (2007). Distinguished Scholar-In-Residence Lectures. 3.